My client had a simple cased opening off their foyer leading into a sitting room. 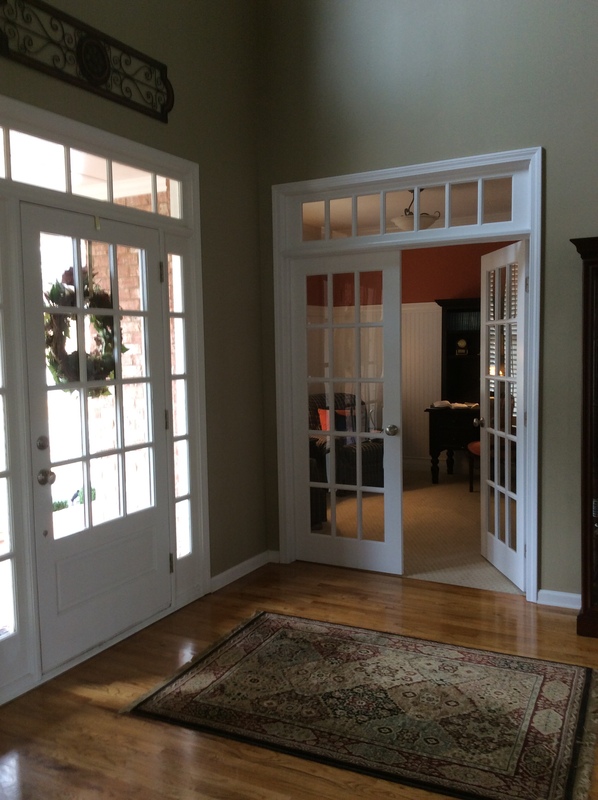 They asked me to install a french door and if possible, a transom to match the one over the front entry door. I found a transom that matched the required measurements and ordered it. When I got it in my shop I noticed the panes were not centered within the framework, so I took it apart, reassembled it, then primed and painted it along with the doors. Once on the job site, it turned out that the height of the transom was more than the specified measurement that was ordered! GRRR!! I had to take the difference from the bottom of the door frame casings and doors. I painted the area above the beadboard wainscoting a rich pumpkin color and installed new casings. Even with all the challenges of this project I was very pleased with how it came together.